We gathered advice from Expo West and Expo East veterans to help brands provide retailers with the very best service and seal more deals. Most retailers cruising the Natural Products Expo West and Expo East show floors tote a big bag (or two or three) to hold all the samples, literature and other materials they snap up from booths. These items help keep intriguing brands top of mind and let them share exciting new items with their staffs back home. So what kinds of materials and information do retailers really want? How much is too much? What would they like to see at your booth but don’t necessarily want to haul home? We gathered advice from show veterans to help you provide retailers with the very best service and seal more deals. This may seem obvious, but samples really are the best way to snag attention. No need to give away the farm, but be ready to offer tastes or small take-home packages. "Samples are always necessary to help expedite our search for new and interesting products," says Mike Asher, chief operating officer of Rollin’ Oats Market & Café in St. Petersburg and Tampa, Florida. Rather than offering numerous pamphlets and flyers, aggregate key info about your brand and products onto a straightforward fact sheet. "Everyone is conscious about excess paper, but until we have the technology to scan everything at the booths, print out a sell sheet and staple your business card to it, and you’ll make many retailers’ day," says Mary Beth Catapano, retail account manager at New Hope Network. "Sell sheets are also the easiest place for me to jot notes," says Thomas Barstow, natural foods director at Guido’s Fresh Marketplace in Pittsfield and Great Barrington, Massachusetts. "I note target price points, when the product launches, how many SKUs, GMO status, whether it’s available through KeHE or UNFI, and any other information not already there." Additionally, sell sheets help your brand stay on retailers' radars throughout show weekend and beyond. "In my hotel room in the evenings, I look over everything I’ve picked up that day and prioritize which booths to revisit," says Laura Sheehan, owner of Full Circle Market in Winchester, Kentucky. "Yes, I could run down to my hotel lobby to print out info, but I’d rather not. Plus, I often go over new items I like with my staff, and if I have flyer from a booth, I’ll show them." While many buyers want tangible information, others would rather conserve paper and receive all the facts via email, mail or your website. So along with sell sheets, also have a paperless (or less-paper) means of sharing your scoop. 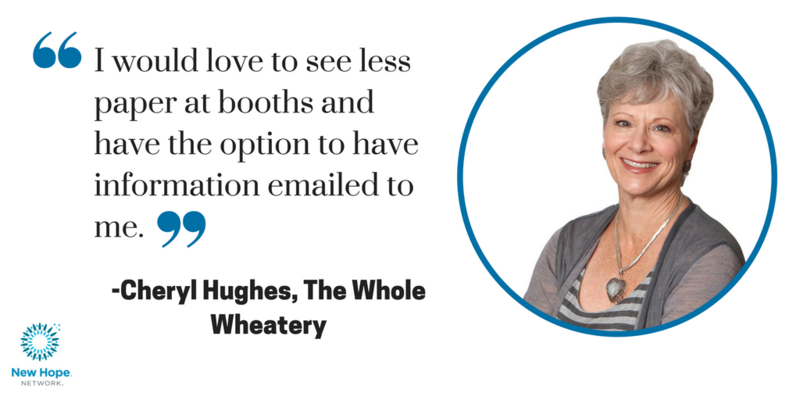 "I would love to see less paper at booths and have the option to have information emailed to me," says Cheryl Hughes, owner of The Whole Wheatery in Lancaster, California. "It would be nice to offer retailers a sample of what we might have printed, with your brand name, vendor account and contact info." Plus, some retailers view you sending the information later as a sign of extra effort to get your products stocked. "Many have a 'no paper' stance and feel strongly that if you want to sell in their stores, you’ll keep track of their info or dig it up on your own," Catapano says. While some retailers attend Expo mainly to peruse and gather intel, most aim to do business, so be ready to take orders. "Even though many vendors offer show deals up to 30 days after Expo, lots of deals are still being made on the floor," Catapano says. "The show wouldn’t exist if buying weren’t happening." Hughes gets frustrated when vendors are reluctant to take orders or don’t have forms on hand. "If I like what you’re offering and am ready to order but there isn’t a way to, it’s tough to stay excited about your brand," she says. Show attendees tote tons of stuff, but they may not have quick access to pens, clips and other handy tools that can help them gather and keep together information about your company. "It’s a real pain if you don’t have a business card attached to your sell sheet, so last year I brought a stapler because many booths don’t have one," Barstow says. Go the extra mile by providing these amenities for them. Buyers tend to hand out hundreds of business cards, and since they don’t always have time to talk, be sure to have a visible bucket or other receptacle for cards. "I like the idea of retailers coming with small cards displaying their contact info and saying 'please send me info about your product," Hughes says. "Sometimes there’s no need for extra dialogue at the booth; we’d rather speak to you at our leisure." Although your actual product is what matters most, remember that packaging is what grabs shoppers’ attention, so show retailers what your item will look like on their shelves. "Packaging must be vibrant, must make you hungry just by looking at it and can’t put people to sleep," Barstow says. "While so-so packaging isn’t always a deal breaker, we have time constraints, so it could be." He adds that overworked or pretentious packaging can be a turnoff too. Retailers love pamphlets, signage and other materials they can display or hand out in-store. And while you can certainly incorporate these items into your booth to show buyers how you’d support them in the future, Expo isn’t the place to dole out these items. "Gathering the promotional materials to use or distribute in my store comes later," Sheehan says. "I don’t want to carry all that home with me on the plane."